I had some left over cooked shrimps from a shrimp cocktail tray from Costco so I decided to ‘repackage’ it by making a ceviche style salad. Ceviches usually involves something raw and letting it cook in the acidity of the dressing. Even though the shrimps are already pre-cooked, the flavors and spiciness of the lime dressing comes through beautifully. This one is really easy and flavor packed. Mix all the ingredients together and toss. It is best if you let the salad chill about 30 minutes before serving to allow the flavors to blend. Nice recipe. 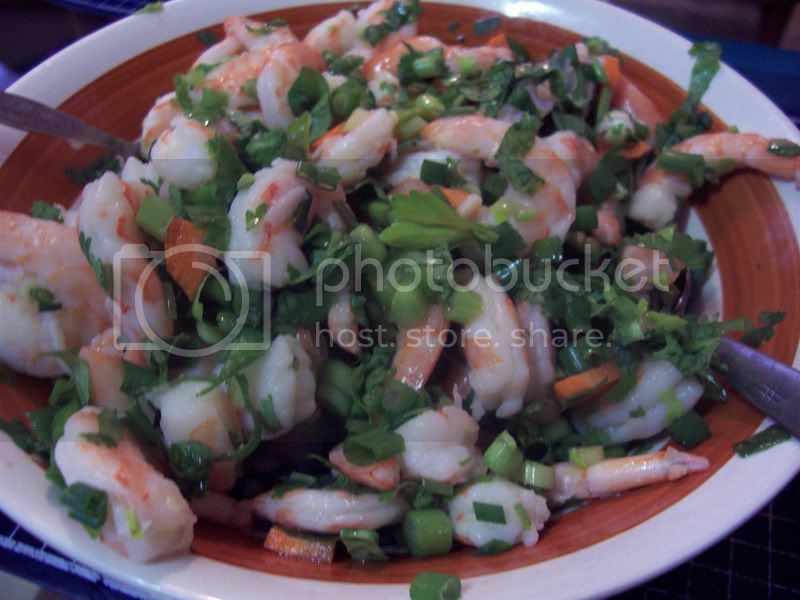 I haven’t had shrimp ceviche before but your recipe makes me want to try it. This looks likes such a great way of getting that shrimp ceviche flavor even though you didn’t have the fresh shrimp. It looks delicious, and congratulations on the brilliant improvising!